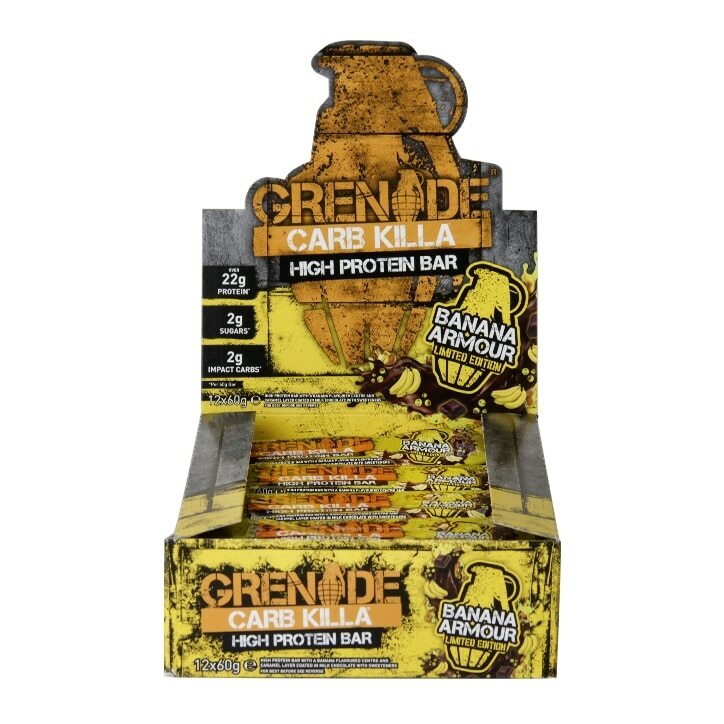 Grenade Carb Killa Banana Armour is rated 4.5 out of 5 by 22. Rated 1 out of 5 by Tom19731 from Very appetising. “Interesting” texture and colouring I thought....maybe not on reflection. Rated 4 out of 5 by Prawn21 from Life Saver Just what I needed for a quick fix of energy, tast lovely. Rated 3 out of 5 by Beach 63 from Sugars Beware polyols are sugars, I know this because my daughter is diabetic and told this. Good taste though. Rated 5 out of 5 by Emmz43 from Yummy!! By far the best protein bar I’ve tasted!! Delicious! Rated 5 out of 5 by Offa from Banana treat Tried this for a change and because I like banana protein shakes and banana armour does pass muster. However, my favourite carb killa bar is still jaffa quake, banana armour a close second. (Third is chocolate mint).